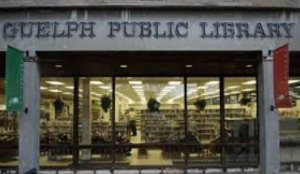 The Guelph Public Library family history collection includes both non-circulating reference material and circulating material that can be borrowed with a library card. There are a number of local history books such as “Guelph: A People’s Heritage, 1827-1927, A History of Guelph 1827-1927 and “Guelph: Perspectives on a century of change 1900-2000” as well as area atlases. The collection also includes resources that provide useful information on getting your research started, organizing what you find, overcoming brick walls and writing your family history, etcetera. The City of Guelph archives which includes private records, school records, photographs, assessments rolls, wills (between 1841-1858 and 1901 and 1903) and other historical records is located in the basement of the main branch of the library and can be accessed by contacting the archivist. Records available on microfilm or microfiche include City of Guelph Council minutes and by-laws, Ontario civil vital statistics, census records, local newspapers, Surrogate court records index (1793-1858), the Tweedsmuir histories and the Goard Fire Insurance Maps (1890-1960). Ancestry.ca is available without a subscription in the main library and all Guelph branch libraries. Access is available only while in one of the library locations. The library also subscribes to a number of genealogy-related magazines which are available in the main branch for viewing. Access to both the ProQuest Newsstand and the Archeion databases are available through eResoures on the library’s website with a library card. ProQuest Newsstand provides access to the Guelph Mercury and Tribune as well as the Toronto Star and the Globe and Mail. The Archeion database includes images and directories related to the history of Guelph. For additional information, visit the Guelph Public Library website. The Wellington County Branch Family History Collection is also housed at the Guelph Public Library. See our library page for more information on how to access this collection. The Wellington County Branch and the Guelph Public Library often partner to offer workshops on researching family history. Check the branch events page for information on upcoming workshops.